Portrait/Interview of Nelly Ben Hayoun By Anna Steward for The Interior Photographer, Photo by Amandine Alessandra. 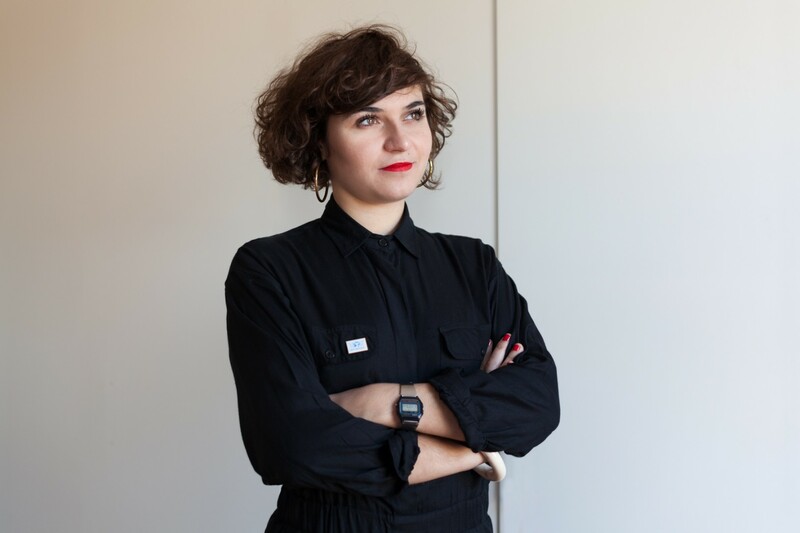 Nelly Ben Hayoun is a creator of extreme experiences. She has been called ‘the Willy Wonka of design and science’ due to her unconventional, highly ambitious projects that bring together different genres. She studied Design Interactions at London’s Royal College of Art and now lectures internationally and works with a highly impressive list of clients including leading museums and design centres. She is the Designer of Experiences at the SETI (Search for Extraterrestrial Intelligence) Institute, Head of Experiences at We Transfer, and a member of the Space Outreach and Education committee at the International Astronautical Federation. In her spare time, she is training to be an astronaut. Her latest project, Disaster Playground, is a large, multi-platform investigation into the future outer space catastrophes and the design of procedures to manage and assess the risks of a potential asteroid of significant size hitting the earth. Sound intriguing? The London Premiere will be at the BFI on 30 June, tickets go on sale on May 12. We were lucky enough to catch her. Interview by Anna Stewart. Your work is diverse: experience, design, film, aeronautics, art, science… I could go on. It’s difficult to categorise. Is there an easy way to describe what it is you do? I design ‘extreme’ experiences for the public to access the surreal and fantastical in science. That means that I design dark energy in your kitchen sink, while a volcano erupts on your couch and you are traveling in space on board of your Soyuz Chair while being bombarded with sonic boums and neutrinos in your bathroom. I wish to create. One narrative can be told through various channels. I believe that by taking an extreme approach (Antonin Artaud talked about “the theatre of cruelty” for that type of radical approach to the public) you really get the public to actively engage with a cause or with research and that is what motivates me with space exploration, for example, which is one of my fields of interest. at NBH Studio will always have this component embedded in them. We work with scientists or experts in each field in which we create your experience, always. There is no point in promising you a Soyuz rocket lift off if it is according to my own belief on what it is like. It needs to be as real as possible, therefore a big part of my time is spent finding collaborators who are willing to share their experiences so we can tailor public experiences as much as possible. In this specific case, it means working with the astronauts who have taken off from the Soyuz rocket and developing a soundtrack and everything about the experience with those individuals. In terms of background: I come from this series of designers called critical designers, speculative designers. My mentors, Prof. Anthony Dunne and Dr.James Auger, taught me while I was at the Royal College of Art in Design Interactions. Prof. Anthony Dunne and Fiona Raby created this whole platform for design debate. Critical design aims to really push the boundaries of design and to reconsider the element of fiction. Narrative is a big part of what we do, but instead of finding answers, we generate questions. For example, how might the future of nanotechnology evolve? How might the future of synthetic biology evolve, and how might the public relate to it? So we try to generate these questions through design and creative practices. The world of Nelly ben Hayoun sounds busy: lecturing, running a studio, PHD, talks at Google and international travel. What’s been the biggest challenge so far? Everything is always a challenge. That is the way I roll. I get bored otherwise. I like complexity, I like huge difficult production. Everything that looks and sounds unfeasible I will want to do. Sometimes it appears impossible and in fact it never is. It is a question of organisation. I am also very lucky to have a fantastic team of people I work with in the studio, all with various backgrounds that keep things very interesting. I work with We Transfer as their Head of Experiences and the SETI Institute (Search for Extraterrestrial Intelligence) as their Designer of Experiences and that makes things even more exiting everyday. It is a lot of work, across different fields, but it also means that my curiosity always has enough food to think and reflect on where we are now, where we might be in the next 10 or 100 years. This makes everyday different and the creative possibilities and potentials are just endless. What can we expect from you next – any clues? First of all, we are releasing our latest feature film Disaster Playground on June 30th, on World Asteroid day! Check out on www.disasterplayground.com for updates. The London Premiere will be at the BFI on June 30th at 8.30pm with special guests for the Q&A, so join us for that! Tickets will be on the BFI website on May 12th. There will be additional screenings planned worldwide too, so look online. Disaster Playground investigates future outer-space catastrophes and the procedures to manage and assess the risks. The film follows scientists who plan, monitor and deflect hazardous NEOs (Near Earth Objects) and the real-life procedures in place in the event of an asteroid collision with the earth. The film follows the chain of command running from the SETI Institute and NASA to the White House and United Nations and we meet the people who are responsible from protecting us from a potentially devastating asteroid impact. it is secret for now! It will be out in the next 3 years! It is a new Loch Ness monster.